Most women have fond memories of playing with their mother’s makeup as young girls. Faces smeared with too bright lipstick, and blue eye shadow from lashes to brows, smiling at the camera sheepishly yet proudly once they were caught. Lime Crime creator Doe Deere is no exception. To the delight of makeup lovers all over, she took that girlish love of color and turned it into a successful makeup company and earned herself the title of “Top Inspiring Female Entrepreneur” by Galore magazine. Lime Crime is one of many companies that saw its success start as a result of the internet. Deere was quickly recognized for her bold makeup choices from pictures she posted on Instagram- a place she still uses to draw inspiration for her makeup. It was only fitting then that it was one of the first online native makeup brands and it has paved the way for others. Doe Deere’s company is best known for its Matte Velvetines lip color, which was inspired by the feel of rose petals. This is not your grandmother’s rose colored lipstick though, it comes in a wide variety of colors with fun names such as Alien, a vibrant green hue, and True Love, a gorgeous bright red. Don’t like matte lipstick? No problem. Lime Crime also offers lip colors with sparkly and metallic finishes, aptly named Diamond Crushers and Metallic Velvetines. In addition to the lip colors the company is so well known for, they offer eye shadow palettes and liquid eyeliner. All of the makeup is for sale via their easy to navigate website. Part of Deere’s vision was to not only revolutionize what makeup looks like, but how people shop for it, and their website accomplishes this with easy to use menus and a pop up live chat feature to help you find exactly what you are looking for. Beyond the bold makeup options, Lime Crime is a company that cares, not only about their consumers, but also about the environment. They have been certified both vegan and cruelty-free in alignment with the personal values of creator Doe Deere, who has shown the world that a little girl with a dream and love of bright color can grow up to revolutionize the makeup industry. 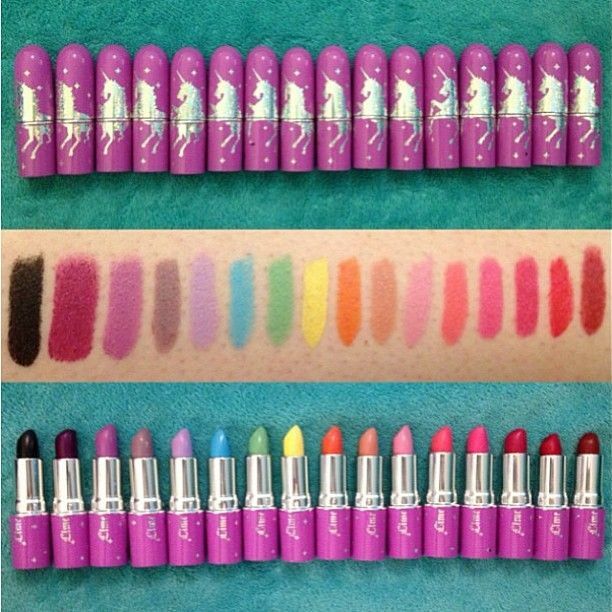 Make sure to follow them on Tumblr for free tips, and great pictures of what Lime Crime looks can do for you.